little bee books, 9781499807202, 40pp. 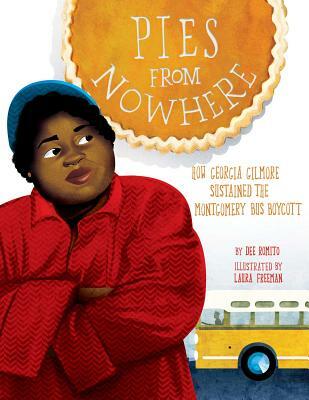 This stunning picture book looks into the life of Georgia Gilmore, a hidden figure of history who played a critical role in the civil rights movement and used her passion for baking to help the Montgomery Bus Boycott achieve its goal. Georgia decided to help the best way she knew how. She worked together with a group of women and together they purchased the supplies they needed-bread, lettuce, and chickens. And off they went to cook. The women brought food to the mass meetings that followed at the church. They sold sandwiches. They sold dinners in their neighborhoods. As the boycotters walked and walked, Georgia cooked and cooked. Georgia Gilmore was a cook at the National Lunch Company in Montgomery, Alabama. When the bus boycotts broke out in Montgomery after Rosa Parks was arrested, Georgia knew just what to do. She organized a group of women who cooked and baked to fund-raise for gas and cars to help sustain the boycott. Called the Club from Nowhere, Georgia was the only person who knew who baked and bought the food, and she said the money came from "nowhere" to anyone who asked. When Martin Luther King Jr. was arrested for his role in the boycott, Georgia testified on his behalf, and her home became a meeting place for civil rights leaders. This picture book highlights a hidden figure of the civil rights movement who fueled the bus boycotts and demonstrated that one person can make a real change in her community and beyond. It also includes one of her delicious recipes for kids to try with the help of their parents! Dee Romito is an author and former elementary school teacher. Her middle grade novels include The BFF Bucket List, No Place Like Home, and The Italy List. She blogs about writing at writeforapples.com, where she and her team share tips to help fellow writers. Dee is also Co-Advisor of Buffalo-Niagara Children's Writers and Illustrators. You can visit her website at deeromito.com. Laura Freeman received her BFA from the School of Visual Arts in New York City and began her career illustrating for various editorial clients, including the New York Times Book Review, the National Law Journal, and New York magazine, and previous titles include Fancy Party Gowns: The Story of Fashion Designer Ann Cole Lowe and Hidden Figures. Laura now lives in Atlanta, Georgia, with her husband and their two children. Find out more about Laura at lfreemanart.com.